It is usually the buyer who prepares a share sale agreement. But because there is great advantage in presenting the first version, we have included provisions that benefit both sides. Our notes guide you as to which ones strengthen your position and which ones favour the other side. The document provides the same high level of protection to the buyer that you would expect for the sale of a whole company including a choice of 125 warranties, a penalty payback provision if net profit is less than a certain agreed sum, and limited warranties from remaining shareholders. The document can also be used by a seller, either to produce an agreement that doesn’t favour the buyer as strongly, or as a guidance document to understand what might be seen as fair and reasonable compared to the document now presented by the buyer or his attorney. The agreement provides the framework to protect the interests of the selling shareholders to the extent that you choose. For example, there is an option to include a guarantor and an option for one of the selling shareholders to be a trustee (as a trustee, he cannot give full warranties). If the seller doesn’t present the agreement to the buyer, he may still wish to include such clauses in the buyer’s document. 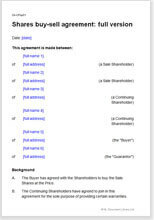 This document differs from many other share sale agreement templates in the number of warranties included. The first is that they protect the buyer, who does not have the same information as the seller about the state (and value) of the company. The second is that they can improve the buyer’s position. Because it is normal practice for buyers to demand warranties, sellers often give them without being sure about whether the situation is as warranted. Buyers can take advantage by asking for more warranties than they might need, and later seeking compensation for those that turn out to be false. We provide a very full set of warranties, in plain English so it is easy to choose whether you want each to be given or not. Sellers will, obviously, want to limit the warranties given. This agreement is for a sale where no new shares are issued - the buyer simply purchases the shares owned by someone else.